Nairobi, November 27 – The evidence is clear: our oceans are at risk. Marine ecosystems are degrading, the oceans are warming, sea levels are rising, and our waters are acidifying. The United Nations has proclaimed a Decade of Ocean Science for Sustainable Development, beginning in 2021, to support efforts to reverse the cycle of decline in ocean health. This initiative coordinated and led by the Intergovernmental Oceanographic Commission of UNESCO, will encourage partners from around the world to collaborate to advance ocean science and support the sustainable development of our oceans. Canadians know that a prosperous economy depends on healthy and sustainable oceans. Today, the Minister of Fisheries, Oceans and the Canadian Coast Guard, the Honourable Jonathan Wilkinson, offered Canada’s support for this initiative, announcing an additional investment of up to $9.5 million in funding to advance activities of the Decade of Ocean Science. “Canada is proud to be an oceans leader and is ready to lend our support for stronger ocean science and sustainable management. We remain committed to taking action and working with our global partners on ocean protection and governance, in order to preserve and protect this shared resource for future generations,” declared Jonathan Wilkinson. 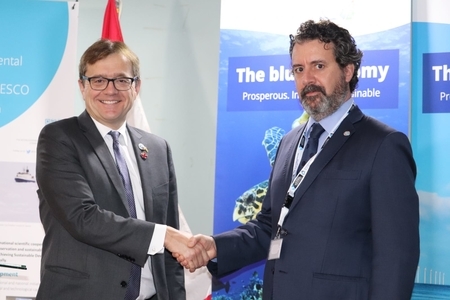 This investment complements Canada’s previous commitments to international ocean science efforts and will be used towards the creation of a project office to contribute to the planning, promotion and coordination of activities related to the UN Decade of Ocean Science. This office would help build scientific capacity, as well as enhance cooperation and communication among stakeholders in marine affairs, in particular through ocean research and observations. More specifically, this coordinated approach to science and monitoring would help expand our collective knowledge of ocean conditions, assist us in predicting the consequences of ocean changes and how best to mitigate their impacts, and support the sustainable development of the ocean economy. Ensuring gender equality in ocean sciences, as in all scientific fields, is a priority for Canada and many other countries and organizations around the world. Through the UN Decade of Ocean Science for Sustainable Development, countries, including Canada, will have the opportunity to advance gender issues and support opportunities for women and youth to succeed in all disciplines, including science. The success of the UN Decade of Ocean Science will depend on the contributions of many partners. Canada looks forward to working with collaborators, including Indigenous Peoples and small island developing states, in its efforts to strengthen the evidence base for decision making and inform tools for ocean planning and conservation.